BOYCOTT ISRAELI PRODUCTS & not labelled yet Israeli products - CAMPAIGN...LETS START !!!! Most consumers do not realise the extent of the penetration of Israeli goods in to Europe, and in particular the UK market. The purpose of this campaign is to draw awarness to this and to encourage people to join the boycott by starting with boycotting 'made in Israel' products. We provide below a background of the current state of the boycott and research in to which Israeli goods are prevalent in UK stores. We follow this by suggesting strategies for implementing the campaign in your community. Is the public ready to boycott? A survey conducted for the Jewish Chronicle in January 2009 found that 47% of British people support the Palestinian position compared to just 22% who support the Israeli line. Nearly 1 in 3 british people (29%) are in favour of boycotting israeli goods, and of those who aren't sure(30%) or feel its a bad idea(41%), most reason that sanctions would have no effect(48%) or worry that it would just harden the israeli position(14%). This survey clearly shows that British people empathise with the Palestinians and are willing to boycott Israeli goods but need encouragement and convincing that it will make a difference. Findings by the Israeli Union of Industrialists revealed that following the attack on Gaza, one in five Israeli exporters are having difficulty selling abroad due to the boycott. Yair Rotloi, chairman of the association's foreign-trade committee revealed "21 percent of local exporters report that they are facing problems in selling Israeli goods because of an anti-Israel boycott, mainly from the UK and Scandinavian countries". 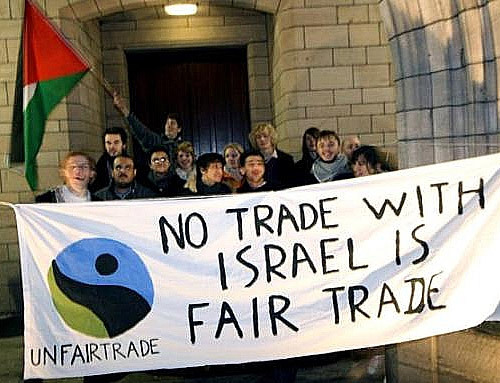 The Israel Export Institute reported in Feb 2009 that 10% of Israeli exporters were receiving order cancellations due to the boycott. The boycott coupled with the economic climate has forced 66% of Israeli exporters to slash prices, and they have called for government intervention to protect them from a growing boycott. In Feb 2009 Israels daily finance paper, the Marker, in an article titled "Now heads are lowered as we wait for the storm to blow over" reported that Israeli businessmen were in hiding, trying to "remain anonymous to avoid arousing the attention of pro-boycott groups". The situation is so bad that it has lead some exporters and retailers in Europe to falsify the country of origin on the packaging of Israeli goods. 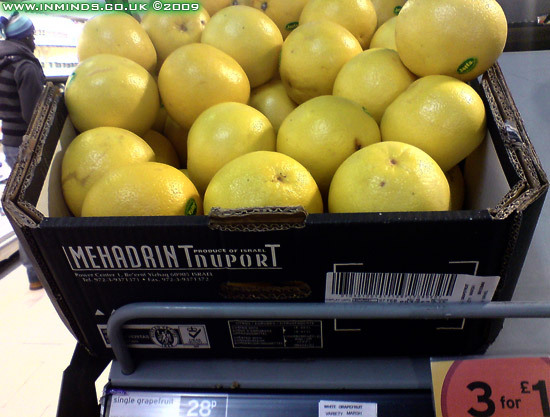 The Cyprus Mail newspaper reported on 19th March 2009: "A leading German supermarket yesterday admitted to effectively misleading European consumers by selling re-labelled Israeli Grapefruit as a product of Cyprus before passing it on to the public.. the decision to pass off the Israeli fruit by the German ALDI chain came after a widespread boycott of Israeli goods in the aftermath of the Israel’s invasion into Gaza in December. 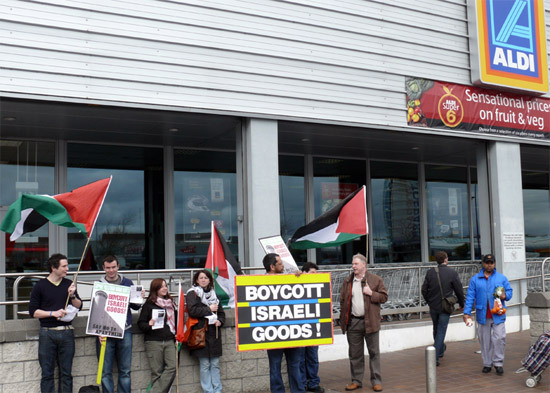 Since then, shoppers across Ireland especially, have been turning their backs on Israeli goods such as fruit, vegetables and electronics and it is thought that stockpiles of Israeli produce are rotting at supply depots." Amid fears that this scam could lead to genuine Cypriot produce being boycotted, farming unions in Cyprus are furious and the Cypriot ambassador to Ireland, Sotos A. Liassides has referred the matter back to his government for vigorous action commenting that Aldi are "trying desperately to get rid of their (Israeli) stock by presenting it as Cypriot." Environmental Health Officers from the Health Service Executive who are under contract to Food Safety Authority of Ireland have also become involved in the issue as it breaches EU regulations on food labelling. 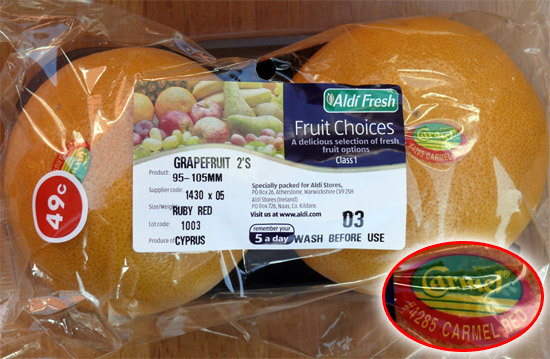 A few weeks later, in April 2009, another Irish supermarket chain, Dunnes Stores, was caught in a similar scam of palming off Israeli grapefruits to customers as Cypriot. Seasoned campaigners will recall that Dunnes Stores was the site of a historic victory in the struggle against South African aparthied when on July 19, 1984 a 21 year old till worker, Mary Manning, courageously refused to handle two South African Outspan grapefruits which resulted in a bitter strike lasting nearly three years, before forcing the Irish governments hand to imposing a total ban on the importation of South African goods. Twenty years after the strike the city of Dublin honoured the strikers with a commemorative placue outside the store and today there is a street in Johannesburg named after Mary. Nelson Mandela recalled: "Young workers who refused to handle the fruits of apartheid 21 years ago in Dublin provided inspiration to millions of South Africans that ordinary people far away from the crucible of apartheid cared for our freedom"(see full story here). In the aftermath of the Gaza attack the UK supermarket Tesco set up a special customer helpline for those who are boycotting Israel. It gauged that the number of calls it was receiving from people complaining about its' selling of Israeli goods was jamming their general customer helpline. When customers rang Tesco's helpline they would now be greeted with the message "If you are ringing regarding Israeli goods, please press one." They would then be connected to specially-trained call centre staff. The extra cost to Tesco of having to setup a dedicated call centre because of the Israeli goods on its shelves was not lost on Jonathan Hoffman, co-vice chair of the Zionist Federation, he feared "The risk is that supermarkets will say it's too much of a problem to stock Israeli goods." 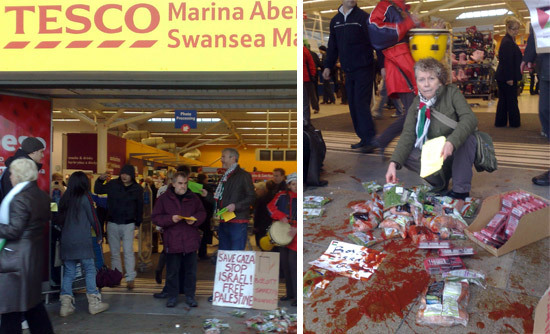 After Tesco came under fire from the pro-Israel lobby who complained that Israel was being picked on as Tesco's had never before singled out a country, Tesco's finally relented and closed the boycott helpline on 6th April 2009. Non-Israeli companies who fear 'boycott by association' are taking action to distance themselves. 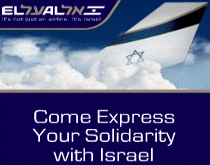 In January 2009 El Al's website ran a promotion stating: "Now, more than ever is the time to come to Israel. Come express your solidarity with Israel. Fly with EL AL and receive 3 or 4 day car rental for free!". The advert had a clearly visible Hertz logo. Hertz were furious and demanded El Al immediately remove thier logo from the advert. Their spokesman stressed that Hertz had not been aware of the promotion being run by EL AL and did not want to be associated with it, further they "regret if any individuals were offended by the language that EL AL used to promote this offer". Another example of such pre-emptive action is that of Lidl and Aldi. During the attack on Gaza, chain SMS's and emails had circulated claiming that "Lidl and Aldi supermarkets declared publicly on TV from their HQ's in Germany that they will donate all their takings/ revenue to Israel during this war on Gaza." Normal company practice would have been to ignore such chain mail, but both companies fearing a mass consumer boycott immediately issued press realses that they do not fund Israel. 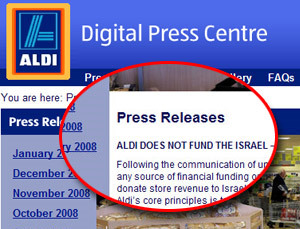 The Adli press release read "Aldi confirms that it does not provide Israel with any source of financial funding or support the Israel – Gaza conflict. Aldi has never declared that it will donate store revenue to Israel during the conflict and any such claims are completely untrue." Some companies are themselves taking the moral stand and boycotting Israel. 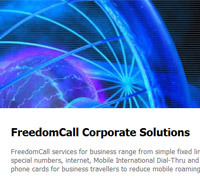 On 30th December 2009, a British telecommunications firm FreedomCall terminated its cooperation with Israel's MobileMax. Richard Ramsey, the managing director of FreedomCall, sent an e-mail to the Israeli tech firm MobileMax. "As a result of the Israeli government action in the last few days we will no longer be in a position to consider doing business with yourself or any other Israeli company." MobileMax CEO Raanan Cohen was shocked by the boycott "We weren't expecting this from them and there was no prior warning.". In January 2009 Israeli news Ynet reported that a London based Pashmina company was refusing on-line orders from Israel, email correspondance revealed they had joined the boycott of Israel due to "horrors committed by the Israeli army." 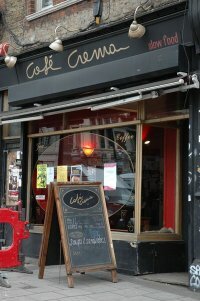 In March 2009 a top London cafe, Cafe Crema in New Cross, put up a notice which reads "we do not use any Israeli products". Despite vilification in the Jewish media and wild accusations of anti-Semitism, its owner Chris Boddington was undeterred, "we will continue to boycott Israel, and we certainly won’t hide the fact.. it’s as legitimate as boycotting South Africa was in the 1980s.. Israel needs to think about why so much of the world is against it.." The cafe also stocks genuine Palestinian products (from Zaytoun). In contrast to Israeli goods, genuine Palestinian products, where available, are selling extremly well. An article in the Guardian newspaper (Feb 2009) titled "Palestinian olive oil bucks UK recession" revealed that as "an unintended consequence of Israel's offensive in Gaza, sales of Palestinian olive oil in Britain are soaring". Equal Exchange, a seller of Fairtrade products, reported a threefold increase in sales of Palestinian olive oil from the West Bank in January compared with a year ago. "We have run out of one-litre bottles and we expect sales to double to 400 tonnes this year compared to 2008," said Barry Murdoch, the sales director of Equal Exchange. The company Zaytoun, also established to sell Palestinian olive oil in the UK, reported a fourfold rise in sales last month instead of the usual post-Christmas lull. Nasser Abufarha, the chairman of the Palestinian Fairtrade Association revealed "we have a buyer in the Netherlands who has sold the whole container before the container arrived, they had enough orders from shops that were very excited, eagerly waiting for the product to arrive so certainly there is a lot of excitement about Palestinian products and a lot of interest in supporting Palestinian communities through the product". 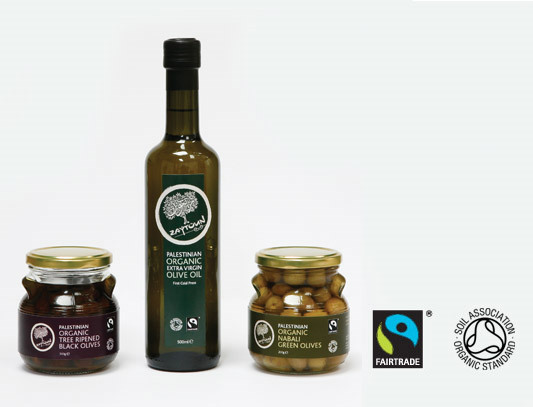 The Co-operative Group is the first supermarket to stock Palestinian Fairtrade olive oil (available in around 300 Co-op stores across the UK from 22 March 2009). In August 2008 Barkan Wineries moved its operation out from the illegal West Bank settlement of Barkan after its parent company Tempo joined the Dutch Heineken Group. Faced with calls of boycott and negative publicity Heineken relocated the winery. The company directors report explained to its stockholders: "In the past, the location of the company's winery at the Barkan area caused a negative image and made difficult the exporting of the Barkan brands. The company is acting to change this image.."
The Swedish company Assa Abloy in October 2008 annouced it was closing its Mul-T-Lock locksmithing factory in Barkan in the West Bank following a daming expose by the Swedish NGO Diakonia which warned that the company may be subject to law suits over its violation of international law by operating on occupied land. Assa Abloy spokesman said: "We are very sorry that we did not notice it before, but we did not understand that we might be violating international law." Israeli water cooler company Eden Springs was forced to close its East Scotland depot after loosing 'hundreds of contract' across Scotland following a determined campaign by the Scottish PSC. Lost contracts include East Lothian and West Lothian Councils, Caledonian MacBrayne Ferrries, Heriot–Watt University, Stevenson College, Scottish Council of Voluntary Organisations, as well as a number of Scottish trade unions and student bodies having all voted to boycott Eden springs explicitly on the grounds of their violations of international and human rights law in the Golan Heights. Its parent company in Israel sells mineral water which it extracts illegally from the Salukia spring in the Golan Heights and has a bottling plant in Katzrin, also in the Golan Heights. The Golan Heights is Syrian territory illegally occupied by Israel since June 1967. Since the closure, Strathclyde University and Dundee University (Feb 2009) have also taken steps to boycott Eden Water. In 2001 Univeler through its take-over of American company Bestfoods it aquired a 51% stake in Beigel & Beigel Ltd which is located near the Ariel settlement on the West Bank. After sustained campaigning and bad publicity with retailers like Harrods clearing their shelves of Beigel & Beigel products (August 2008), Uniliver finally announced in December 2008 that it will sell its stake in Beigel & Beigel - for the multi-national the negative publicity in keeping an illegal bakery of 140 workers just wasn't worth it. On 5th January 2009, th Co-operative Group chair Len Wardle announced : "The Co-operative Group board has decided to suspend sourcing products from illegal West Bank settlements. However, we will continue to trade with Israel and will seek to develop trading links with Palestinian farmers. The Co-operative Group only rarely curtails trade with particular countries or regions. However, in the case of the illegal settlement in the Israeli controlled occupied territories, it has proven to be all but impossible to ensure that supplies derived from the region are not perpetuating injustice and unfair terms of trade. We will no longer source dates, grapes and a number of herbs from the illegal West Bank settlements and will be phasing out the use of similar items from our own brand products." This followed a sustained campaign of pickets and represetations from consumers demanding the Co-op live up to its ethics policy. Having achieved victory regarding the boycott of settlement goods campaigners are now lobbying the Co-op to boycott all Israeli goods. On 13th February they picketed a meeting of the Co-operative in Aberdeen, a representative from the meeting revealed that a motion on a full boycott had been put forward from the Scottish Co-op for discussion by the UK executive. Alstom and Veolia are partners in the CityPass consortium, contracted to build a light rail tramway system linking west Jerusalem to illegal Jewish settlements in occupied east Jerusalem therby directly helping Israeli annexation of the territory of east Jerusalem. In March 2009 the Swedish national pension fund AP7 excluded the French transportation giant Alstom from its portfolio due to Alstoms involvement in Israel’s occupation of Palestinian land. This follows the 2006 decision by Dutch ASN Bank to exclude Veolia from its portfolios. At the time ASN Bank explained its decision: "Veolia's involvement does pose a problem for ASN Bank in applying the banks' social criteria on Human Rights. We believe that Veolia's involvement in the light rail project is not in line with the UN's demand to stop all support for Israel's settlement activities, and is therefore not in line with ASN Banks' social criteria.. we are of the opinion that Veolia's activities in Jerusalem are in conflict with UN Resolutions. Therefore, on this current information Veolia will be removed from our investment universe." In April 2009 Veolia lost a local government contract in Bordeux worth 750 million Euro to manage France's biggest urban network, and in March 2009, Sandwell Metropolitan Borough Council expelled Veolia from the list of tenders for a waste management contract worth £1 billion over 20 years. This followed a sustained campaign from activists across Europe exposing Veolias illegal activities in the settlements. Legislation Margaret Thatcher put in place to protect apartheid era South Africa prohibits local authorities in the UK from taking in to account moral considerations like human rights violations when allocating contracts. This means councils can not admit to being influenced by such considerations, so Sandwell Council announced their decision was purely a business one. This follows a similar decision by Stockholm community council in January 2009 not to continue its contract with Veolia who had for the past 10 years been contracted to run Stockholm' Subway. The new contract for the next 8 years was worth 3.5 billion euro, the biggest in Europe. Veolia’s involvement in the controversial Israeli tramway project has been intense in Swedish media with politicians demanding on prime time tv that Veolia should be excluded from bidding because of its involvement in the Israeli light rail project that illegally runs on Palestinian land. In August 2006, Veolia were forced to cancel plans to train Israeli engineers and drivers on the Dublin Luas light railway after the Irish trade union SIPTU, representing the drivers on the Dublin tran system, refused to train them due to the illegality of the Israeli line. And these victories are having an impact on the ground in the settlements. A recent Jerusalem Post article (3 April 2009) revealed widespread disillusionment amongst settlers who have been hit hard by the combination of the intifada and the boycott. A settler living on the Ma'aleh Ephraim settlement in the Jordan Valley, sometimes refered to as Israels capital in the Jordan Valley, revealed "there was an industrial zone, but since 2002 the hangars are empty. It's impossible to bring people there and foreign companies won't come because of the boycott [on West Bank products]." House prices in Ma'aleh Ephraim have dropped to a third of their value, and around 80% of the settlers who founded the colony in 1978 have left and a similar proportion of the current population of around 1,400 would leave if they had the means to do so. This is a far higher figure then the Nov 2005 Israeli survey which found that "25% of settlers would leave immediately if they were offered comparable housing within the Green Line." In our research we highlight any settlement linkage. It has been suggested that one way to identify Israeli products is to look at the barcode. The first 3 digits of the EAN 13 digit barcode indicates the country in which the barcode was assigned, barcodes assigned in Israel start with the number 729. Unfortunately Israeli products can still be assigned barcodes outside of Israel, for example a UK company selling Israeli products may assign UK barcodes to it. 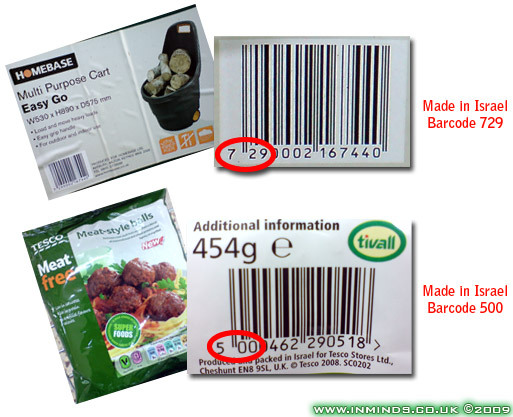 The two examples below show an Israeli Keter product rebranded Homebase which has retained the Israeli barcode (729), and a Tivall product which has been produced and packed in Israel for Tesco - yet it has acquired a UK barcode (500). So whilst a 729 barcode is a good indication that the product has been made by an Israeli company, not all Israeli goods have 729 barcodes. According to Israels Agricultural Ministry, in 2007 exports of Israeli fresh agricultural produce was worth $1.34 billion and most of it, some 80% was exported to the EU. 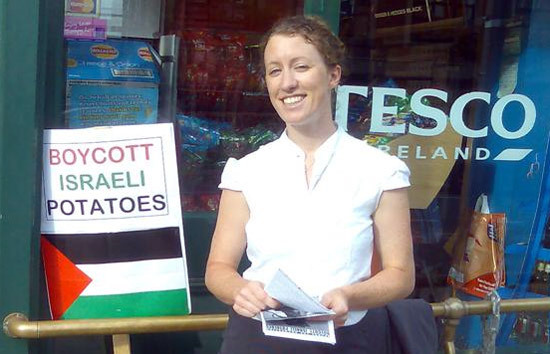 If you visit the fruit and vegetables section of any supermarket in the UK you will discover a disproportionately large amount of fresh produce imported from Israel and its illegal settlements on the Occupied Palestinian Territories. This even includes Israeli potatoes, shipped over 2000 miles to compete with the UKs own indigenous main crop. Two in every three potatoes Israel exports to the EU ends up in the UK, even Israeli King Edward potatoes have been seen on the shelves of M&S! Last year Israeli exporter Mehadrin Tnuport Export (MTEX) boasted of tripling its potato sales to the UK, this despite the frosts which had badly hit the israeli potato harvest. One of the regions where potatoes are grown is the water rich occupied Golan Heights, though this special crop is mainly for producing potato seed which are then used to grow potatoes for export through out Israel. Most supermarkets sell fresh herbs sourced from the illegal Israeli settlements on the West Bank. These are labelled 'West Bank' or 'Israel'. 'West Bank' never refers to Palestinian goods as they don't make it past the military checkpoints, and the little that does like Zaytoun olive oil is clearly labelled 'Palestine'. 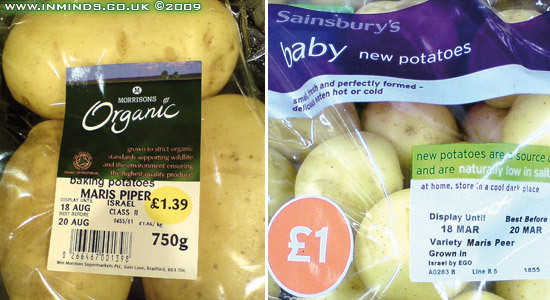 Often settlements goods are labelled 'Produce of Israel' to avoid payment of tariffs when entering the EU - according to the EU-Israel Association Agreement goods produced outside the recognised borders of Israel (ie on the israeli settlements on the Palestinian Occupied Territories) are not exhempt from import duties. A July 2008 Channel 4 news report revealed herbs grown on the illegal No'omi settlement on the West Bank, destined for the UK, were being mislabelled 'produce of Israel' in breach of the EU-Israel Association Agreement. The No'omi settlement, built in 1982 on stolen land, is adjacent to Jericho and today houses 130 colonists. In the same report Asda supermarkets statement read "We don't take any exports from the West Bank", yet as the photo below taken 7 months later, in Feb 2009, reveals Asda still sells herbs grown on the illegal settlements on the West Bank (see letter campaign below). 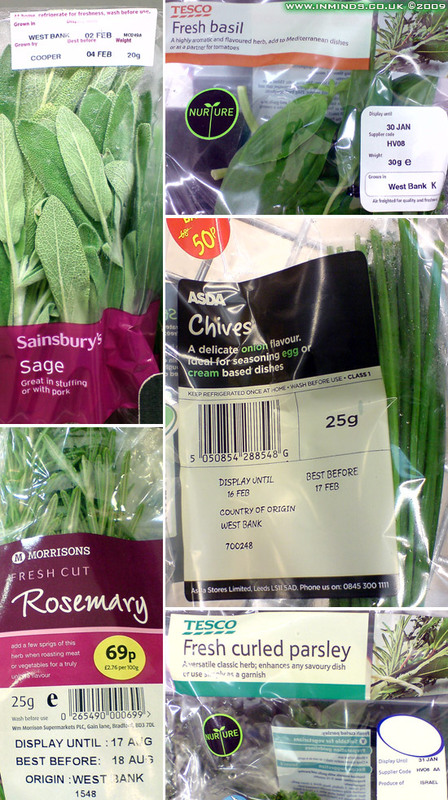 All the major supermarkets sell herbs from the illegal israeli settlements (labeled 'West Bank' or 'Israel'). Waitrose (not pictured above) is perhaps the worst offender when it comes to selling settlement goods. Perhaps the most pervasive israeli fresh produce in our supermarkets is the bell pepper. A quick visit to a local supermarket (Tesco, but it could have been any supermarket) revealed they had on display 18 baskets of bell peppers (see below) with 7 different products for sale. Every single one of them bar one was from Israel, and the one that wasn't was part of a pack in which the other peppers were from Israel, so effectively you couldn't buy a pepper from Tesco's without supporting Israel! Israel is the country that has recorded the highest increase in volume of all the countries that export peppers to the EU: the figure of 27,369 tonnes exported in 2002 had risen 250% to 96,492 tonnes by 2007, and the forecast for 2008 was 110-120 tonnes. Pepper growing needs land with water resources which restricts its cultivation to the Arava Valley in Southern Israel and the Jordan Valley in the occupied West Bank. To achieve these record exports to the EU, the pepper production area has had to dramatically increase. Between 2007-2008 it increased by 25%, and in 2008-2009 the increase was 15%. In an interview Mr. Yiftach Yechie, Arava area manager for Agrexco-Carmel, Israels largest exporter of fresh produce, indicated that the increase in the cultivation area was mainly in the Jordan Valley where the crop had "doubled" in 2007-2008 (increase in Arava was only 8-10%), this is indicative of theft of more Palestinian land by Israel to use for growing peppers for export to Europe. The Jordan Valley, comprising nearly 30% of the West Bank, is the most fertile part of the Palestinian Territory. The Israeli army controls 44 percent of the land with another 50 percent held by the 36 illegal settlements in the valley. Indigenous Palestinians are left with only six percent of their land, and Israel has its covetous eyes on that remaining land. Last April the Israeli Army handed the villagers of Bardala village in the northern Jordan Valley a military order to confiscate 238 dunums (nearly a 1000 acres) of their land. The order stated the army was "confiscating these lands for military reasons to build the Security Wall", in November 2003 the army had already confiscated 424 dunums for the same given reason. But this is just the tip of the theft, when this section of the "security wall" is built it will cut the village off from most of its farming land - the villagers will lose access to over 5000 dunums (well over 20,000 acres) of agricultural land! Some of the confiscated land from the village of Bardala and its neighbouring villages has already been used to create illegal roads connecting the nearby israeli settlements of Mehola and Giv'at Sal'it. 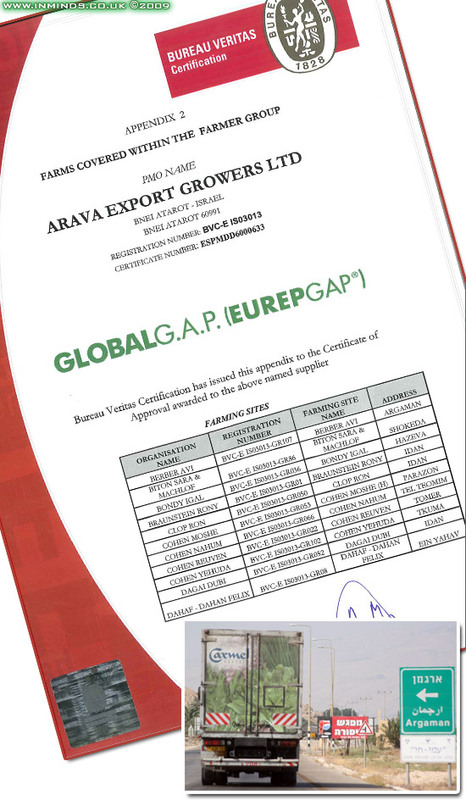 Arava Export Growers GlobalGAP Certificate reveals its many farms on the settlements in the West Bank starting with the Berber Avi farm on the Argaman settlement in the Jordan Valley. The Argaman settlement's name betrays its dark history, steeped in ethnic cleansing. In Hebrew it literally means 'purple' but is actually an acronym to honour two Nahal commanders: Lt. Colonel Arik Regev and Lt. GAd MANela. Israels Nahal military brigade was specifically set up to support Jewish settlement growth and expansion by ethnically cleansing Palestinian people from their land at gun point, to initially create military outposts and gradually transfer the land on to the settlers. Argaman was one such outpost, taken by the Nahal brigade in 1968 and converted to an agricultural settlement in 1971. Today 166 colonists live there, sustained by exports of agricultural produce to Europe. The inset photo shows a truck belonging to Israels #1 fresh produce exporter Carmel Agrexco at the Argaman settlement. Global GAP is a private body set up by retailers to set standards for the certification of agricultural products around the globe (GAP = Good Agricultural Practice). Supermarkets require producers to be Global GAP certified before accepting supply from them. The certificates can reveal what produce is grown and the farming site where it is grown. Israels third leading exporter of fresh produce is Arava Export Growers Ltd. Its Global GAP certificates reveals that its main crop by acarage is Herbs (309.7 Hectares) and Peppers (242.05 Hectares) and that nearly a fifth of its registered farms are located on the illegal settlements in the West Bank (17 out of 92). These settlements include Argaman, Fatzael, Masua, Mehola (Jordan River Herbs & others), Netiv Agdud, and Tomer. For Organic produce the figure is far worse, with half of Arava Export Growers farms that meet Organic Certification (NOP) located on the settlement of Mechola (Mehola), these include Jordan River Herbs (registered under its owner name - Shamay Foraiter), and are certified to grow herbs and red peppers. Arava Export Growers website also displays Tesco's own "Natures Choice" Certificate of Comformity for supplying Tesco with herbs. In 2008, Israel's citrus exports totaled approximately $100 million, mainly to Western Europe. The UK is the No. 1 market for Israeli citrus, followed by Scandinavia, Russia, Germany and France. 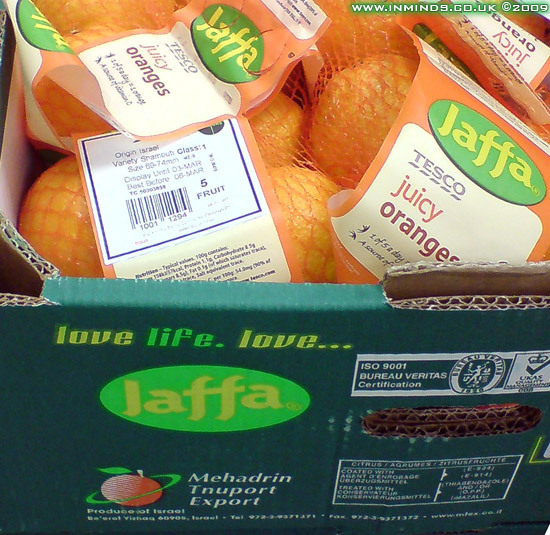 The most recognisable Israeli brand on the supermarket shelves is the JAFFA brand seen on citrus fruits. Its owned by the Israel Citrus Marketing Board and is licenced to several supplers including Agrexco and Mehadrin Tnuport Export (MTEX). 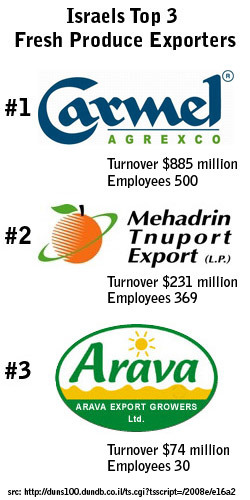 MTEX is Israel’s largest grower and exporter of citrus fruit responsible for 67% of overseas sales. They supply most of the supermarkets including Tesco and Sainsburys. 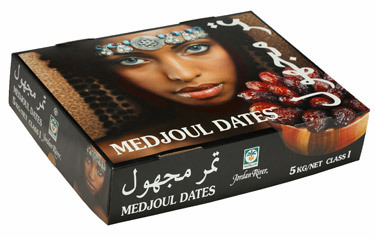 Their other exports include Madjoul dates which their website admits are grown in the Jordan Valley, on the occupied West Bank. Can you tell these are Israeli? This is an excellent step. The only products I have been buying since the past 2-3 years are either purely local, European or Asian. Can anyone shed light on how much Israel or pro-Israeli companies dominate the electronic/high-tech industry? Everyone i know who is Muslim is partticipating. KINLEY is a coca-cola company. No? Nestle DOMINATES the Pakistani market. Dairy, aqua and other daily use products are being sold in Pakistani shops. Even PIA gives NEstle products to its passengers. I am seeing that the boycott movement is getting companies worried enough to try to distance themselves from Israel. Starbucks released an official statement denying donations to Israel, and Garnier apologized for distributing sanitary products to IDF female soldiers. Barcode is 871 and 729. Recently Israel added 871 quietly. Please circulate and let everyone know.